Chittagong having the gifts of nature was once called 'the Queen of the Orient'. Moreover, its seaport, because of its geographical location and as the country's busiest, is one of the most important harbours of Asia; and thereby also considered as the soul of our national economy. Chittagong may be considered as the 'catchment area' for heavy industrial and commercial developments as well as for tourism facilities for a large area covering the Seven Sister Provinces of India, Nepal, Bhutan and China on the Northern and North-eastern parts, and Myanmar, Thailand, Vietnam, Cambodia, Malaysia, Indonesia and Singapore on the South-eastern region. Considering the regional importance and its growth potentialities, it has become a crying need to provide Chittagong, the commercial capital of Bangladesh, with urban facilities of international standard and to create the necessary infrastructure. Urban mass transportation is one such service, which deserves optimum attention. Like other important cities of the developing countries, Chittagong is under considerable pressure from distress migration from the rural areas in its hinterland. To accommodate the increasing population satellite towns have developed at Sitakunda, Hathazari, Fateyabad, Patiya, Boalkhali and elsewhere. At present these are mainly residential developments. Industries have primarily been located in selected zones such as Bhatiary, Patenga, South Halishahar, Kalurghat and Sitakunda. The central business district (CBD) of Chittagong has remained in its original position. The huge conglomeration of commercial facilities in the city centre triggers massive flows of traffic. To avoid the gruelling commuting (average may be up to four hours each way) people try to live as close as possible to their workplaces, defeating the very purpose of the satellite towns which was to reduce the load on the old city centre. Lack of proper MRT (mass rapid transit) is restricting urban growth in the port city. Additionally, the established developments are facing multiple constraints. As elsewhere in the country, Chittagong's MRT is road-based and is not only facing serious problems but it fails to meet the demand. Railway tracks also connect central Chittagong with northern and southern parts of the district. The British government took it as a very effective mode of transportation but that too have been almost destroyed. Therefore, the time is ripe to consider rail -based MRT. The railway service started its journey within the geographic borderline of present Bangladesh from 15 November 1862 with the construction by Eastern Bengal Railway of 53.11km of broad-gauge (5'6" or 1676 mm wide) line between Darsana and Jagti, Kushtia. On 1 July 1895, a 149.80km meter-gauge (3' 33/8" or 1000 mm wide) line between Laksam and Chandpur was opened by Assam Bengal Railway. On 3 November 1895, the Chittagong-to-Chittagong Port line was constructed. In 1929 the Chittagong-Hathazari meter-gauge section, in 1930 the Hathazari-Nazirhat meter-gauge section and in 1931 the Sholasahar-Dohazari section were opened. On 1 Jan. 1942, Assam Bengal Railway was merged with the Eastern Bengal Railway under the name Bengal and Assam Railway. In 1947 Bengal and Assam Railway was split up and the portion within the boundary of former East Pakistan was named as Eastern Bengal Railway, the control remaining with the central government of Pakistan. On 1 February 1961, Eastern Bengal Railway was renamed as Pakistan Eastern Railway and in 1972 it was renamed as Bangladesh Railway. There are three major terminals and a depot within the Chittagong City Corporation area: Kadamtoli Bus Terminal, Rangamati Bus Terminal, Chandgaon Bus Terminal and the BRTC Bus Depot. Kadamtoli Bus Terminal: This terminal is in the heart of the city near New Market. Around 1200 intercity private buses operate through this terminal daily. This terminal causes traffic congestion in the busy city area. Rangamati Bus Terminal: It is near Muradpur, which is a little far from the city's busiest area. Around 250 intercity and inner district private buses operate from here. Chandgaon Bus Terminal: It is at Chandgaon, which is also a little far from the city's busiest area. Around 400 intercity and inner district private buses operate from here. BRTC Bus Depot: It is on the periphery of the City Corporation area near the Chittagong Cantonment Area. In Greater Chittagong there is no BRTC bus service. Various private agencies are giving the service without any coordination among them. According to BRTA about 400 buses, minibuses, maxis and riders operate. The amount of roads in Chittagong is only 10% of the total area whereas the requirement is 24%, according to Karim (2005). The entire sector lacks a well thought out plan. There are many deficiencies. Loading condition: Overloading on buses in the city is a habitual scenario. People always struggle for place on the foothold of buses because the buses generally remain jam-packed during the peak hours. Ticketing and queuing: Ticketing is responsible for the quality of bus service. In Chittagong, conductors of mass transit modes collect fare from the passengers on board, but they do not issue any ticket against the fare. Queuing for using the bus service is not practised. Normally the tendency of the passengers is to rush in and out of the bus in an undisciplined manner. Stoppage location: There is no proper use of the few bus stoppages that are in the city area of Chittagong. Passengers get on and off randomly at any place. Buses usually stop at a bazaar, shopping centre, office, school, college, busy intersection and wherever there is a crowd or a person wants to get off. Spacing between bus stops: Spacing between bus stops has a direct effect on the total travel time and this travel time is the most important criteria in mass transport design. If spacing is very close, total trip time would be high. Wright and Paqualte (1987) suggested that preferably the frequency of stops should not exceed three to four per kilometre. 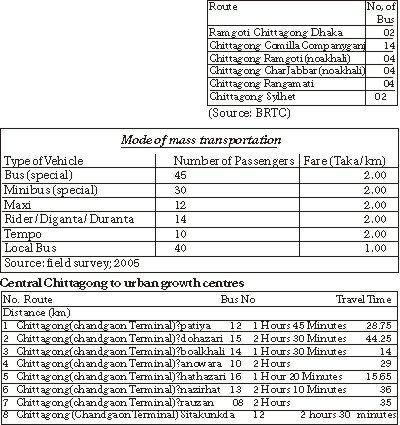 It has been observed that in the Chittagong City Corporation area a bus stops up to 10 times while covering one km of road. Some times the driver waits for as long as it takes to get the bus overloaded. For example: New market to Anderkilla; the distance is 0.5 km; in-between stoppages at GPO, Kotwali Thana, Court building, Laldighi, Janata Bank, Bakshir vit. Road widening program: In a bid to reduce the traffic jam road widening works is going on at various locations of City Corporation area. (6) Although from October 2003 local bus service on all routes except two (Route 5 and 7) was withdrawn, people are not getting proper service in those so called special seating service buses. The contribution of Bangladesh Railway (BR) to urban public transport is very small. British wisdom had given Chittagong a head start by connecting the city with the northern and southern parts of the city. Nowadays not only in developed countries like England, Germany and Japan but also in many developing SAARC countries like India and Sri Lanka the MRT is rail-based. "But in our country for the will of donor groups and corrupted politicians only the road transportation has been given the most magnitude in our total transportation sector, and rail or nautical transportation has been neglected totally. (Kibria; 2004). Nevertheless, historically rail transportation system generated several developments in Chittagong and the surrounding areas of Sitakunda, Nazirhat, Hathazari, Patiya, Dohazari and so on. The rail tracks and stations still exist today but most of them are out of use now for long or only a few trains run on them. There is no express train from Sitakunda to Chittagong or from Chittagong to Sitakunda. Some intercity express trains (Sylhet-Chittagong, Chandpu-Chittagong, and Dhaka-Chittagong stop at Sitakunda station and carry small share of the commuter traffic load. *A local train stops at all important, less important, or very unimportant stations, which increase the travel time. Northern Chittagong: Sitakunda, Hathazari, Fatikchhari, Fateyabad, Rawzan etc. are developed locations of this part of Chittagong. Southern Chittagong: Boalkhali, Patiya, Anowara, Dohazari etc. are developed locations of this part of Chittagong. Central Chittagong (CCC area): Chittagong (Town) consists of 6 thanas, 68 wards, and 236 mahallas (neighbourhoods). It has an area of 209.66 sq km.